There have been a lot of changes in my life lately. I am starting a new stage, full of exciting challenges, amazing opportunities and a lot of possibilities. 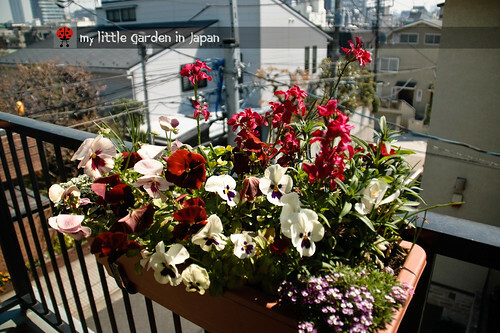 One of those changes is the new house and my new little garden in Japan. The new balcony is just great. It fits all of my plants and a little more, has an amazing sunlight and a great location surrounded by parks. I am sure the garden will thrive in here. I was afraid that after all the time I was away my garden would have gone completely dry. I did ask my landlord to keep an eye on them, but I could not count on it fully. So when I arrived I went straight outside. Even tho I could not see well because there is no light on the balcony, I could tell they had not been watered at all. As I poured some water, the pots made a loud sizzling sound that only very dry soil make when it finally gets some drink. However, I was amazed to see that even though almost all of the plants were flopped and down, there were flowers everywhere. All of the plants did a rush to bloom and refused to die. It worked only because of the mild sun of spring, if it had happened on summer all the garden would have died. 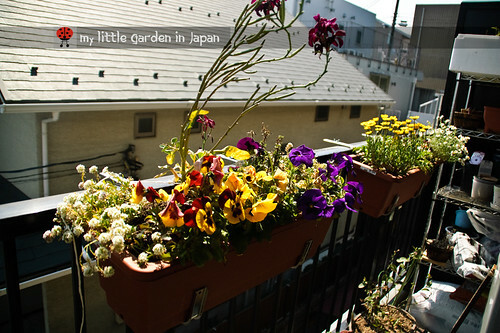 The cozy sun and the plants instinct to grow in this season help them survive. It seems that spring saved my garden. I am very happy my garden made it. 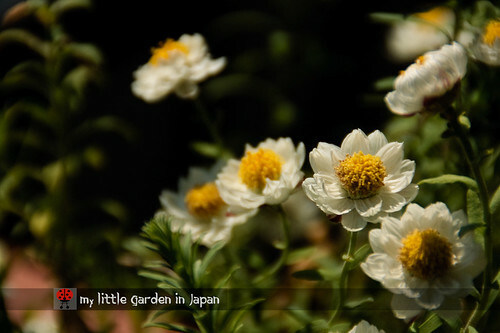 The only sad part is that because of the accelerated bloom, I did miss some events on the garden. 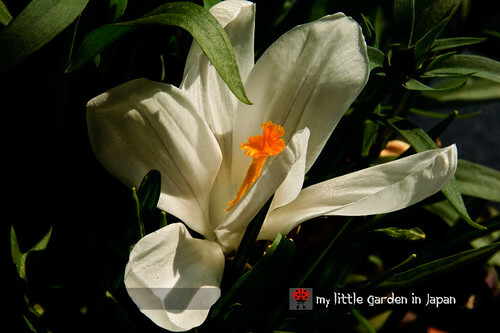 The crocus was already spent and only one flower remained. The tulips are all out (only one bulb did not sprout) so I could not see the buttons. 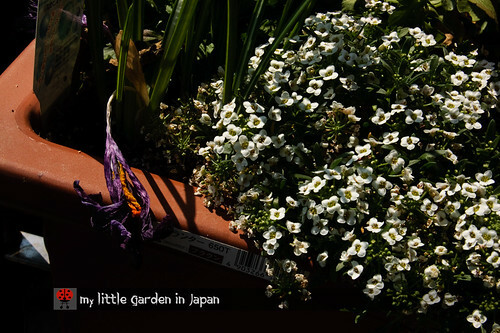 Also most of the vegetables, specially the komatsuna and the bekana, bloomed, so I have to re-sow anyway. The only casualty was the chocolate cosmos. The poor plant must have been just to weak to fight after having being broken by the wind last time. Also, the red rose and the maple tree got sick. The have something that looks like powdery mildew or some kind of white rust. I hope they recover. Also, after my small hiatus I have decided to redouble my efforts and try to make more of this blog. I have a bunch of how to's and many other projects planed, so please keep posted. Please help japan with a donation or good thoughts. My best hope for those in Japan. You can help donate here. Welcome back! Glad your plants survived! They're beautiful! Fer, Your garden has done very well. You are very good with it no matter where you are. 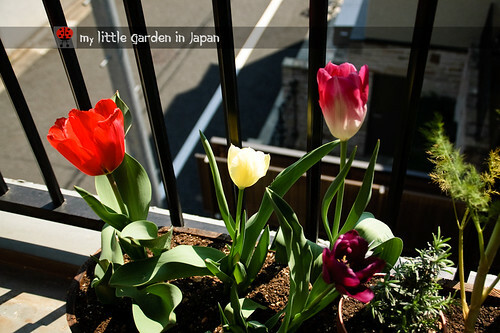 Your garden looks beautiful, very springy! sometimes when plants have a difficult time, they will start to flower to produce offspring just in case they dont survive, if you save them, you might have offspring as well as the mother plant. You can easily make your own automatic watering system. Just keep some plastic bottles, fill them with water and if you want, some plant food, bury a part of them upside down in the earth inside the pots. For larger pots you can add 2 bottles. Put one of a few sticks inside the ground so the bottle is secure and wont be blown off the pot. This way your plants will have at least some water if the caretaker doesnt water them for you. Its virtually free, youll just have to keep some old bottles and some sticks, and i advice you to test it when youre home, so you can see how long the full bottle will give your plants water. All I have to say is that for what confined space that you must grow in, everything appears that much more lush and beautiful! It looks lovely Fer - maybe you need to try to set up some sort of self watering system for when you are away if your landlord isn't reliable. Your garden looks wonderful. A bright spot I am sure. Glad you are back and hope all is well. Thank you very much! Is good to be back. And I am very happy the garden made it and enter full spring. hare majesteit ~ Yes that is a great idea, I usually do that when I go away, just that this time with the moving I didn't had time to set it up. Also sometimes the wind knocks them over, that happened last summer and I ended with a bunch of small tomatoes. I think your landlord who promised to care for your plants needs a good slap for letting you down like that! He is obviously not a gardener himself. I'm sure your new bigger balcony will soon fill up. 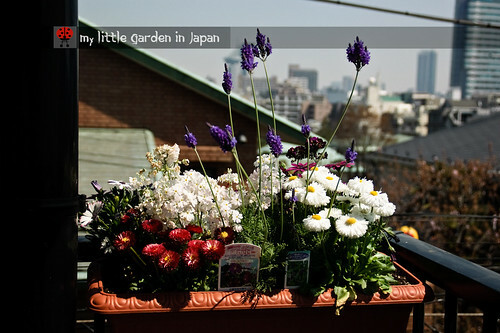 Plants expand to fill the space available: that is the "First Law of Gardening". Its good to know your plants survived despite not being watered for so long. The spring blossoms are simply amazing. Nice! You would never know from your photos that the plants suffered and dried out! They look quite vibrant and I'm glad that everything survived and now appears to be thriving. Welcome back! Amazing that your garden survived so well. It is looking very colourful and I am sure the plants are glad to have you back! Welcome back and Okaeri nasai! I hope your new life in Tokyo will be great despite some problems and confusion caused by the earthquake. 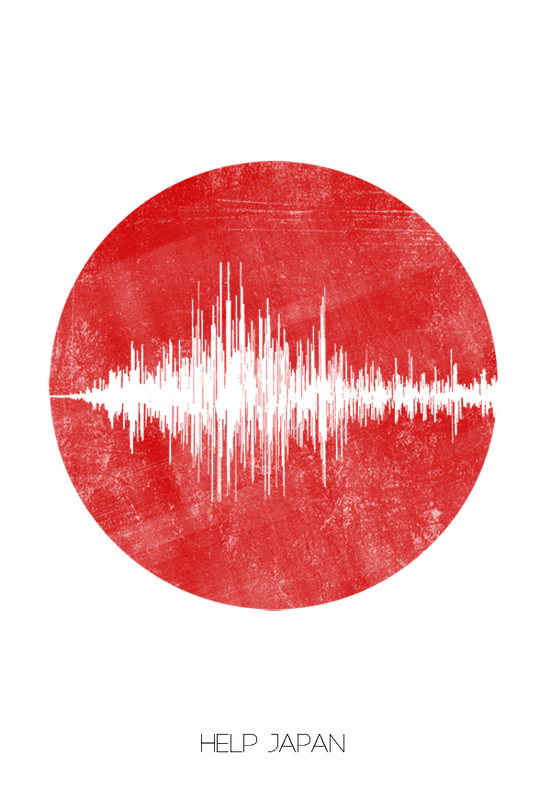 Many foreigners, who were afraid of unsubstantiated information about radioactive scare, went back ( or evacuated) to their home countries but you are so brave to decide to come back to Japan and I'm proud of you! The plants look great! I'm sure it's because they were so healthy to begin with! :o) Great gardening!! ¡Caramba, Fernando! 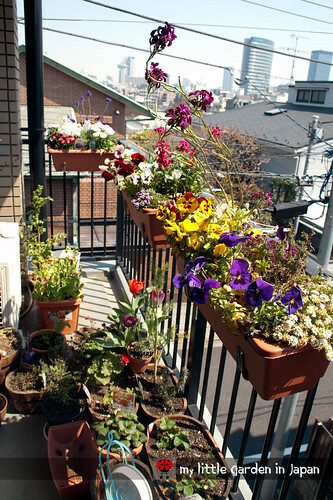 You've got more gorgeous plants on your balcony than I have in my whole yard! I am green with envy!